Fantasy Scroll Magazine is an online, quarterly publication featuring science fiction, fantasy, horror, and paranormal short-fiction. The magazine's mission is to publish high-quality, entertaining, and thought-provoking speculative fiction. 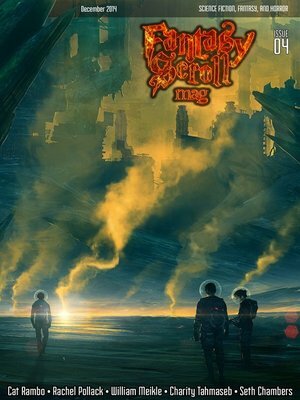 With a mixture of short stories, flash fiction, and micro-fiction, Fantasy Scroll Magazine aims to appeal to a wide audience.Issue #4 includes 12 short stories:"Circus in the Bloodwarm Rain" — Cat Rambo"Forever" — Rachel Pollack"The Dragonmaster's Ghost" — Henry Szabranski"Restart" — William Reid"Feeling All Right" — Richard Zwicker"Universe in a Teacup" — Seth Chambers"Skipping Stones" — Erin Cole"Incriminating Evidence" — Charity Tahmaseb"Posthumous" — James B. Willard"Your Cities" — Anaea Lay"Seaside Sirens, 1848" — Anna Zumbro"#Dragonspit" — William MeikleIn the non-fiction section, this issue features:-Interview With Author Cat Rambo-Interview With Author Charity Tahmaseb-Interview With Author William Meikle-Interview With Editor Lynne Thomas-Artist Spotlight: Kuldar Leement-Book Review: Half a King (by Joe Abercrombie)-Movie Review: Interstellar (2014) (Christopher Nolan)The magazine is open to most sub-genres of science fiction, including hard SF, military, apocalyptic & post-apocalyptic, space opera, time travel, cyberpunk, steampunk, and humorous. Similarly for fantasy, we accept most sub-genres, including alternate world, dark fantasy, heroic, high or epic, historical, medieval, mythic, sword & sorcery, urban fantasy, and humorous. The magazine also publishes horror and paranormal short fiction. Cat Rambo writes and teaches in the Pacific Northwest. Among the places her work has appeared are Asimov's, Weird Tales, and Tor.com.